When you build your Gallereo website you are able to choose a site title. Along the road you might find that your career takes a change of direction, you change your name, or you would just like to change the name of your website. With Gallereo, that's not a problem. We've made it really easy for you to be able to change your website title at any time. 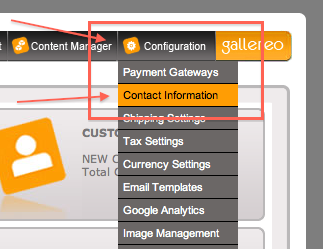 All you have to do is go to the Configuration Menu and select Contact Information. In here there is a field called Website Title, and all that you need to do is add your new name here, and press save at the bottom of the page. Your site title will be changed, instantly, and you can now enjoy your new name.